We've heard and read that Jim Boeheim delegates a lot of coaching to his assistants, but now it has finally been confirmed. Veteran sports scribe is writing a Boeheim biography and shared how Hopkins is much more than a recruiter. Brockton lineman Aaron Monteiro committed to Addazio over the weekend. Jim Christian is a new name getting floated. The longer this drags, more random names will get floated. I still think we land a relatively established coach. But we will see how this plays out. Women's Tennis lost to Clemson. Everyone can breathe now. In a game that defined back and forth, Ian McCoshen's 3rd period goal proved to be the game winner as BC beat UMass-Lowell 4-3. It's back to the Frozen Four for Jerry York and crew. BC scored first but spent much of the 1st Period killing penalties. The Riverhawks tied it before the end of the period and the teams exchanged goals the rest of the way...until McCoshen's score. This will be BC's seventh Frozen Four in the last 11 years. We are lucky...and spoiled. Go BC! Predictably as soon as Harvard announced Amaker was returning, the media started writing that he rejected BC. To reject something you have to be offered. Did anyone consider that maybe BC had concerns about another Ivy success story floundering in the ACC? Or maybe Amaker's inability to win big at Michgan caused some doubt? As readers know, I was never excited about Amaker. I don't see BC fans years from now talking about letting Amaker get away. The best news is that we are nearing an end. BC's moving on after crushing Denver 6-2 in the NCAA Tournament opener. Everything clicked from the start, but Gaudreau really made the difference. He scored three times including in the first minute. BC plays the winner of Lowell and Minnesota State Sunday. As the coaching search continues, it seems some BC fans are getting restless, while some in the media are having a field day posting nonsense. My suggestion is to ignore most of it. As with the early Donahue news, it is probably wrong. This is not like the days of Gene when he would freely share his thoughts and opinions with media, staffers and boosters. Bates is different. If you are waiting for validation or insight from any of the mainstream media, then rely on the Globe's Michael Vega. Despite my occasional frustrations with Vega's beat work, the guy is well liked at BC and has the most trusted sources. If BC is going to hand news to anyone on anything, it will be Vega. Just look at his news on Hanlan leaving and others considering transfers. The Hanlan stuff is looking accurate and so is the transfer speculation (although BC won't release or address any player status until after the new coach is hired). I've tweeted this before, but let me also say that Bates is talking to many people and many names that have not been leaked or speculated. I don't know what he will do, because he doesn't talk to me or any others writing about the situation. I still have trust that this process will produce a good coach. Let it play out and avoid the BS coming from people who have been wrong so many times before. i spend more then 40 hours a week watching football wheres MY union? Great moments in sports writing, "Amaker’s name may or may not have been on that list, but it was on a list." Addazio picked up the commitment of another offensive line prospect. This time it is Syracuse native John Phillips. He is the fourth commitment in the 2015 class. BC moved the baseball series with Florida State to Rhode Island. Denver hockey is ready for BC. Buccigross also broke down the NCAA Tournament. Although Spring Practice began weeks ago, BC did not rush the public updates to the Football roster. Now it is finally up to date. The new roster confirms most of the gossip and speculation that has been out there for weeks. Notable departures include Spiffy Evans, Marcus Grant, Brian Miller, Dominic Appiah, Win Homer, Tahj Kimble, and Victor Nelson. Aside from Evans, none of those players were significant contributors last season. But it does hurt our depth among pass catchers and along the lines. Other items of note include Bordner officially being listed as a Wide Receiver and all the early enrollees getting numbers and official measurements. All the attrition is natural. There will probably be more departures after spring and summer. As long as we don't lose key players, this won't set BC back. In fact the scholarship churn just enables Addazio to bring in that many more recruits in this next class. If you follow one subject long enough you start to realize that a story can pop due to little more than a passing comment. Take the "Walter McCarty to coach BC" stuff that has creeped up in the last 24 hours. McCarty makes a comment and then all the sports and news outlets in New England comment on his comments. Meanwhile he's probably not even getting a second glance from BC. I don't know McCarty. He may have earned his stripes as a recruiter for Louisville, but I don't think Bates is going to spend much time on an NBA assistant who has never been a head coach. But take the story and run with it Boston media! The ACC Tournament plans to come to Brooklyn in 2017-2018. That's good news for BC fans who have yet to make the trip down south for the games. I knew we were a blot on Syrcacuse's resume, but I didn't realize they were the worst team to start 25-0. Baseball had to move their game against Northeastern. Softball cancelled their game with UMass. As Brad Bates travels across the country for his face-to-face meetings with coaching candidates, the familiar worry has set in among BC fans and the familiar BC bashing from the media has begun. This is a reminder: don't worry about any of it. Marquette. Not even close. RT @williewatston: @GoodmanESPN better job: BC or Marquette? Plenty of good coaches want the BC job. The media can say whatever they want, but power is clearly consolidating in college sports. Midmajors don't win NCAA Tournaments. Schools without football don't win NCAA championships anymore. For a coach with real championship ambitions, BC is a step up. Some programs like Marquette may have traditionally spent more than us, but that doesn't mean we aren't able to spend on the right coach. BC competed for the ACC under Skinner. A good, ambitious coach knows we can do it again. BC comes off as cheap in many of these discussions but it usually is not in context. Could we pay a Buzz Williams or a Ben Howland more than $2 million a year? Sure and we might if we get a coach we want that can demand that sort of money. But should a coach we hire from a midmajor automatically get $2 million? No way. Not if you are running a good business. I don't think we are going to lose any coaches to money this time around. Bates is clearly methodical, but I don't think it is costing us the right candidate. Bruce Pearl was never coming to BC, so his early decision with Auburn was not a factor in the BC search. Masiello might bolt for USF, but a job hopping Pitino protoge was not getting the BC job for just that reason. Marquette doesn't have an AD or President and just lost their coach on Friday. To think they are going to have their new guy in place tomorrow is just not realistic. BC will know our new coach soon enough. Once Bates starts meeting with candidates, agents will start leaking names. Until then, no one knows anything because Bates doesn't talk. The Hockey team earned the No. 1 seed in the Northeast region. They will play Denver Saturday. Baseball lost another ACC series, this time to Wake Forest. The lone bright spot is that BC didn't get swept and won their first ACC game of the season. The Globe featured Freshman third baseman Johnny Adams. Lacrosse lost a close game to UNC. In case you missed it last week, here is the latest Andre Williams diary for MMQB. "Amaker walked into a disaster area at Michigan and did make things better pretty much from the drop. Brian Ellerbe had filled the roster with ne'er-do-wells and many of them left either on Amaker's hiring or once they discovered that Amaker had a problem with them, say, jacking contested threes from halfcourt on the regular. Amaker came in, nailed down a top-50 point guard from Texas named Daniel Horton, and made Michigan generally competitive except for one year where his team was destroyed by injury. Unfortunately, that's where the improvement stopped. Michigan was perpetually on the bubble under Amaker and never got over the hump. His teams continually turned the ball over and he never got over .500 in the Big Ten except for one year where Michigan started out 0-6 with losses to Central and Western Michigan. His recruiting was wildly erratic; he was capable of getting kids to Michigan that few others would have managed but he also made crazy early offers to guys who had no business at a D-I school--a couple in fact transferred to D-II Saginaw Valley State, where they were bench players. Beilein inherited a mess comparable to the one Amaker did, without NCAA sanctions hanging over the program. It does seem that Amaker's figured a few things out at Harvard he never did at Michigan. His time at M was seven years ago, as hard as that is to believe. He's built the Crimson into the most impressive Ivy program in 50 years. You would get an instant and real recruiting bump and he would get BC to a level where they're at least on the bubble. It's a defensible hire." Thank you, Jim Calhoun. By letting the college basketball media know you are interested in the BC job, you gave the position a bit more appeal. However, you are never ever ever ever getting the job. Like ever. Putting aside Calhoun's obnoxious comments about BC over the years, his sketchy relationship with NCAA rules and inability to graduate players, the biggest issue with Calhoun is his age. The man is weeks away from turning 72. Brad Bates specifically mentioned energy for this job. Do you think he wants a guy who recently broke his hip and has battled cancer? BC should have hired Calhoun in 1986. We didn't and it changed the course of UConn and BC basketball forever. But this is not the time. As for real candidates, I've learned that Bates doesn't have a tight or final list yet. He's talking to plenty of people and getting background. Amaker is being considered but is not the leading candidate. In fact there is no "leading candidate." When Wake Forest forced out Bzdelik, some speculated that they locked up Howland. Yet reports Friday say that they are going after Shaka Smart first. I also predict in the coming days you will hear unnamed sources or talking heads saying that BC is not a good job. Nonsense. Most of that is coming from coaches and assistants who won't even get contacted. I am not delusional with regards to our place in college basketball or that we need to invest in facilities and up our basketball budget, but unless a coach has a better job than BC, he would take the BC job. Just know that regardless of what the Boston media says, if Tommy Amaker stays at Harvard it is not because he didn't want to coach at BC. BC needs a strong hire. The basketball program is a mess. Needs to be rebuilt by someone with vision and energy. The last 5 @BCHoopNews head coaches previous jobs were head coaches at Cornell, Rhode Island, St. Bonaventure, American & Lafayette. #AskBradBates Did you get a mod? How pissed is Phil Jackson that he rushed into the Knicks job not knowing the Boston College job would open up? Even before the media started speculating, I knew Tommy Amaker was a leading candidate to replace Steve Donahue. That always gave me pause. Amaker may come to BC and do very well, but he's not who I want. I feel we know enough about Amaker to question if he would ever lead BC to an ACC Championship or Final Four. The transition from the Ivy League to a major conference is very difficult. BC just learned that with Steve Donahue. Do we really want to replace him with another coach from the Ivy League? Everyone knows about the difference in recruiting at the two levels, but I also think the intensity of the league competition is much different, as is the expectation level. Aside from Donahue, other Ivy coaches who made the jump have either struggled or plateaued as perennial NIT teams (Carmody at Northwestern and Robinson at Oregon State). The biggest Ivy successes are Fran Dunphy at Temple and John Thompson III at Georgetown. And neither of those situations are comparable to Amaker taking over BC (given Dunphy and Thompson's prior connection to their respective programs). I keep reading that Amaker had to rebuild Michigan. That's not really the case. He had a full scholarship allotment while with the Wolverines. The postseason bans he inherited didn't impact his first team (which was under .500) and probably kept his second team out of the NIT. That's it. The rest of the time, he had no sanctions or obstacles. Yet in his final four seasons in Ann Arbor, he never made the Tournament and never finished over .500 in Big Ten play. I know he's a different coach now and supposedly learned, but he couldn't win big at Michigan. That should be a big red flag. Michigan has so many things that BC does not (national following, highly appealing to recruits, the ability to recruit anyone) and the best Amaker could do was 8-8 in conference and NIT bids. Amaker is a good recruiter and recruiting is how he is winning at Harvard. He just has better players than most of his competition. We need a good recruiter and we need an infusion of talent. But we also need someone who can develop the talent and out scheme the other teams. You can't just out recruit your opponents in the ACC. There is too much parity and elite talent throughout the conference. I've been wrong about plenty of coaches before. (I was the one who thought Donahue had a tournament team this year.) Amaker may be great once he leaves Harvard. And I do think he will recruit well wherever he goes. But I think this time around BC can find a great recruiter who is also a great coach. The Heights and Eagle Action both posted updates on Spring Practices. It sounds like Murphy has a slight edge at QB and Addazio is managing around injuries. BC also announced the schedule for the Spring Game. Baseball moved its home opener. PA Oline prospect Hayden Mahoney recently visited BC and picked up an offer. BC also has interest in Indiana Line prospect Jared Thomas. The search begins officially now. But as Bates said in his press conference, every AD in the country has a list. It now becomes a matter of working the list and finding the right coach. Unlike past BC leaders, Bates plays his cards close to the vest. I don't think you will hear much leaking. News will lean heavily on speculation. However, we can glean a few things from Bates' work during the football search. 1. He's not afraid to reach out to a big name. During our last football search we know Bates reached out to Al Golden and Bill O'Brien. There's also been speculation that he talked to Chip Kelley. Even at the time all of those names were longshots, but it is encouraging that he approached them. I don't think he's going to get Tom Izzo or Coach K, but I am confident that he won't let a name or current salary keep him from exploring interest. 2. Recruiting matters...a lot. Bates follows recruiting closely. He knows it is the lifeblood of the program. It was Addazio's biggest strength and probably what ultimately cost Donahue his job. We couldn't let him comeback and hamstring the program with a mediocre 2015 big recruiting class. I don't know who our new coach will be but I expect him to have a reputation as an ace recruiter. 3. Fan opinion doesn't matter that much. The "splash" of the hire in unimportant to Bates. He said so during the press conference. He wants the new coach to be the right coach. A temporary splash can be a fringe benefit, but not the priority. 4. Administration opinions do matter. One of the reasons Bates hired Addazio is that Addazio wowed the BC Staffers and the school had already done its due diligence on him in 2009. Bates put stock in that...or at least more stock than he did in the boosters who told him not to hire Addazio. I don't know how this will play out. I hope for Howland, but there are plenty of good candidates. The Globe said Amaker is the leading candidate. That makes sense since he is a known recruiter and already has a few different BC constituents pulling for him. I am not a fan of Amaker, but will wait to see how this plays out a bit. I don't expect this will be a rush job. We have one of the better openings and many of the coaches and assistants we would want to interview are in the tournament. There are no guarantees in any of this. However, it is nice to have hope and it is comforting that we didn't waste an extra season of everyone's time like we have in other sports. I wish it had worked out differently for Donahue and BC, but this is the right move. When everyone knows things are not working out, holding out hope for a miracle turnaround just prolongs the inevitable. Now BC can give another coach a shot at rebuilding the basketball program and give the current basketball players a chance to win. I will have more tonight after the press conference and when the first replacement names start getting floated. Boston College has fired Steve Donahue, sources told ESPN. Story coming. Obviously we've seen various reports over the past few days. Official word will have to come from BC. Goodman is Boston based and has a good track record, so I do believe it. I thank Donahue for his service and wish him luck. BC picked up another Massachusetts recruit for the 2015 class. Lineman Chris Lindstrom verballed to Addazio over the weekend. He does not have another FBS offer, but does have interest from Kansas State, UConn and Maryland. Hoffses posted and interesting Q&A with our Strength coach Frank Piraino. Ohio Lineman Sean Rattay plans on visiting BC soon. Another local big man is going elsewhere. Baseball suffered through another winless ACC series. Jerry York likes to call this time of year "trophy season." This year we will be missing out on one of the pieces of hardware as Notre Dame eliminated BC from the Hockey East Tournament on Sunday. 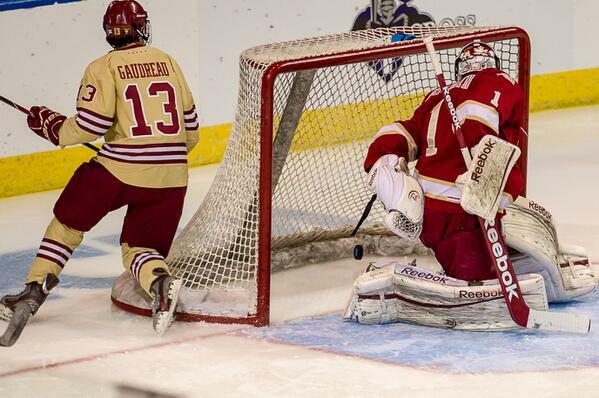 This is the first time since 2004 that BC failed to reach the Hockey East semis. The good news is that BC remains a lock for a No. 1 seed in the NCAA Tournament. However, losing means that BC is unlikely to be the No. 1 overall seed. No big deal. To win the trophy that is most important, you have to beat good teams along the way. After the game, York said the team was devastated. 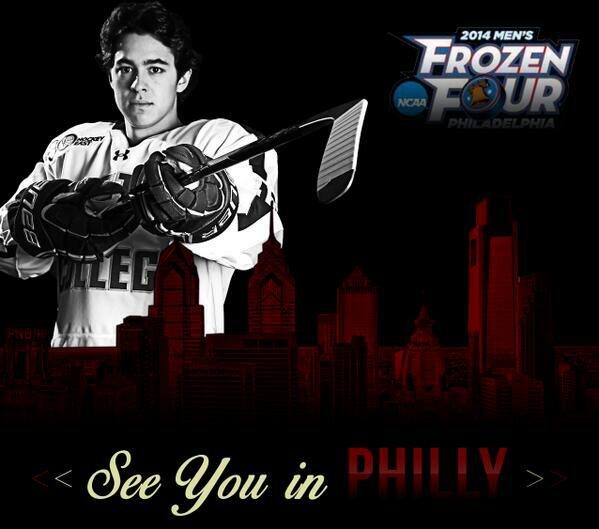 I trust that he will have them in the right frame of mind when the puck drops in the NCAAs. After a disastrous night Friday, the BC Men's team bounced back and evened their series with Notre Dame. Gaudreau led the way with two goals and two assists as BC beat the Irish 4-2. The teams will play Sunday afternoon to see who advances in the Hockey East Tournament. The news wasn't as good for the BC Women. They lost to Clarkson 3-1. 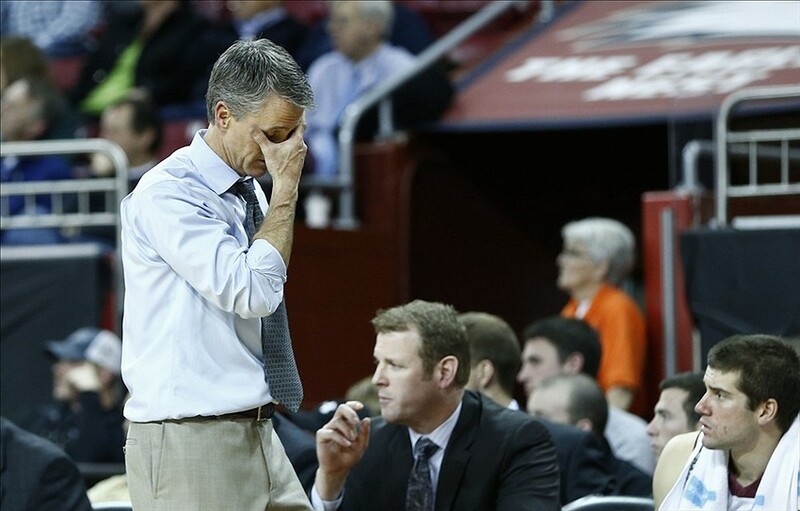 The loss eliminated the Eagles from the NCAA Tournament. Even after the Syracuse win, Brad Bates was actively seeking feedback on potential replacements for Steve Donahue. Bates thought Donahue underachieved last season, so this year’s disaster was even more disturbing. Since the Syracuse game names were even submitted to Bates. He was ready to make the move. BC lost to Georgia Tech in the ACC Tournament and no announcement came. Then Thamel broke the news that Donahue is returning. Given Thamel's relationship with Donahue, I assume Donahue is his source. Of course feedback was filled with shock and disappointment...and no official announcement from BC. So what's going on at the Heights? Friday morning a source with access to Leahy adamantly told me that Leahy was not interfering and no decision had been made. This echoed what another person close to Bates said. Blauds also wrote the same thing. But that doesn't make any of this better. All the decision makers knew when the season was ending. All knew a decision had to be made. But here we are not only without an official announcement, but with BC not controlling the message! This is not that hard. There is no new information in play. The decisionmakers need decide if he is staying or going. Then you make an announcement and live with the repercussions. There are only a few different explanations and none of them are good. -- Explanation 1. Despite wanting him gone, Bates and/or Leahy either had a change of heart, decided to give Donahue one more year. Donahue -- or someone very close -- told Thamel. Thamel broke the news. BC didn't prepare a statement because they weren't ready or wanted to share it with important boosters first. This isn't a sound plan, but it is the most simple and most likely. -- Explanation 2. BC's leadership really haven't come to a decision but someone jumped the gun in letting Thamel know. This is the party line coming from BC. Another guy swore to me that neither Bates nor Leahy are the source for Thamel story and were surprised by it. While this might give hope to the anti-Donahue crowd, none of us should be encouraged by BC not having a decision ready or a clear message. -- Explanation 3. Donahue or someone close to him lied to Thamel. I don't want to believe this. I like Donahue and Thamel. However, the Thamel story without a quick, official follow up from BC is strange. But Vega's story from Wednesday still lingers. Vega is not the type to run a story without a good source. Most read it as anti-Donahue. Could the Thamel story be Donahue's camp making things difficult for BC? I would like to think not, but I've seen these things turn ugly. I've been wrong plenty of times, so take it for what it is worth. I know Bates wanted a change. Something or someone changed things. Maybe BC didn't expect this sort of blowback. I don't know. Most likely Donahue is staying. Thamel's story was pretty definite. If so, BC has mishandled this situation on multiple levels. Stay tuned. I will post more when I know more. That sound you just heard was the 5 remaining season ticket holders throwing out their renewal notices. @bcatleagle I am booking my BC tickets for the final four next year. SI's Pete Thamel -- who is pretty connected at BC -- reported that Donahue is staying one more year. Even if you don't fire your coach, Brad Bates will have to make some statement on Donahue and his future. It was that kind of season. He'll also have to explain the move to some angry boosters. I think this is the wrong move for many reasons. But ultimately the record says it all. Once there is an official statement and I know more, I'll explain why this is a mistake. BC lost their ACC Tournament opener to Georgia Tech. A late push by BC made it interesting, but the season came to an end with another close loss where Donahue seemed to over manage the final possessions. Now we wait for coaching news. The good news is that Patrick Heckmann played well again. That's important since he might be the only one left next year. I tweeted this out earlier today, but I am not too worried about Vega's article. Hanlan should explore his NBA options. There could be truth to Rahon leaving, but I don't think it will make or break the program. Anderson was the surprise. It wouldn't make sense for him to leave for one year. Ultimately it will come down to the new coach and how he rerecruits the players here. BC posted pictures of the Pro Day. 29 teams showed up. That's encouraging for the players who weren't invited to the Combine. Of the non-invitees I still think Rettig, Freese and Ian White have real shots at making it as undrafted Free Agents. BC continues to make offers to 2016 recruits. The latest is Connecticut Tight End Scooter Harrington. It is hard to hate Steve Donahue. It is hard to even dislike him. Polite and engaging to the casual fan and media. A proponent of a hyper-efficient offense to please the sports analytics crowd. A tireless worker who has his hand in all aspects of the program, that keeps his bosses and other Administration folks impressed. Armed with a deep and experienced roster and a elite guard entering his fourth season at the Heights, it was all supposed to come together now. But it didn’t. That’s why there is no joy in calling for his job. I decided to post this prior to the ACC Tournament, because this isn't totally about Donahue. It is also about what I want in a coach. College fans might have been the first to launch “firecoach.com”, but what does a blogger do when your ideal coach doesn’t work out? You move on and admit that all the things you wanted in a coach are unimportant. Can you imagine any other ACC coach helping freshmen move into their dorms? And not their own bluechip recruits, but regular skinny, scared freshman. But there Steve Donahue was last fall, helping new BC students hang posters, grabbing the other end of that box with dad and telling mom the right spot for the family picture. And this wasn’t some move of a desperate coach trying to win over a few fans. Donahue was accessible and welcoming from Day 1. This is what we are all supposed to want, right? That’s why colleges are so quick to hire one of their own. They want someone who loves the school and community as much as they do. Yet as nice a gesture as it was, no one really cares beyond the few people that got the unexpected VIP service from Donahue. The empty student section is proof that your typical BC freshmen doesn’t have some blind loyalty to Donahue. Analytics are everywhere in sports, but not many coaches still rattle them off during a casual interview. Donahue championed a 3-point shot dependent, highly efficient motion offense at Cornell. At BC -- with ACC caliber players -- it would take things to a new level. And it did in his first year…with Al Skinner’s players and future pro Reggie Jackson. As his own players came into the system the offense has remained one of the better ones in college basketball, however, the defense has been terrible. Using Kenpom’s Adjusted Defensive metrics, BC has the 300th defense in college basketball. You don’t need to been a Sloan Conference panelist to know that is bad. Over analyzing things also painted Donahue into a corner with this season’s schedule. The numbers looked perfect. BC would play a RPI friendly and challenging schedule and earn points with the selection committee. No bubble for his veteran team. In hindsight, It looks like Wile E. Coyote must have crunched the schedule data. Instead of earning respect with the ADs and their selection metrics, BC got thumped early and often. They lost on the road. They lost at home. They lost to traditional powers and rising MAC teams. Whether the losing shattered their confidence or tuned them out on their coach (or they just weren’t that good to begin with), the players never recovered from the out of conference slate. The only carryover to ACC play was continued losing and bad defense. Upsetting Syracuse generated some positive attention but also reminded many how screwed up this season has been. Why hadn’t the group that beat the Orange been able to beat or even compete with so many lesser teams? All of Donahue’s positives might earn him another year if things were just a little better. If there was hope that he could shape a defense to compliment his excellent offense. If just one elite recruit committed for next year, giving BC that missing piece to overcome the ACC’s best teams. If the team had just played better in the final month of the season, showing improvement or even just some resilience. But the Eagles sit at 8-23 and barring the miracle to end all miracles, the ACC Tournament will be over quickly. Improving his staff or finding an incredible last minute recruit won't do it either. Four years shows that this won't work at BC. There are lots of ways Brad Bates can go with Donahue’s replacement. He probably won’t find someone as perfect on paper. Hopefully he finds someone who will win on the court. Brad Bates faces a series of decisions with regards to Men's Basketball in the coming days and weeks. He knows. We know. And it really should be the top of mind, since outside of Football, basketball should be our biggest revenue generator. However, an empty Conte is causing deficits, not surpluses. Once dealt with then his next big issue will be BC Baseball. Baseball's problems are two fold. First Bates needs to determine if we are any good. The Florida swing wasn't encouraging, but there is still a lot of baseball to play. If Gambino doesn't show improvement and competitiveness, then he needs to go. Being a BC grad is always a plus, but you cannot overlook losing forever. Gambino's ties to Gene and the fact he was selected over more experienced candidates, doesn't bode well for him getting the benefit of the doubt from Bates. The second issue is to finally ask if BC Baseball can be competitive. The potential baseball-only, weather friendly field may never materialize. Part of it is legal issues. The other part is BC playing a constant game of Tetris with our building and available land. Each day that the field does not get built is another season and recruiting cycle lost. Then there is the Lacrosse-Baseball debate. I am a baseball guy, but there is no denying the Lacrosse Alums are more vocal and supposedly more willing to spend on a team. And given the demographics of each sport and our geography, I think it is fair to ask, is BC more likely to succeed in baseball or lacrosse? It shouldn't be an either or issue, but budgets and Title IX mean that is always will be. I don't envy Bates. Hiring and firing is never fun. But it might be easier than ever figuring out what BC Baseball can be. Since we were traveling, I didn't see a minute of the loss to NC State. So my analysis doesn't mean much for the actual game itself. But the game should put to rest any notion that the out of conference schedule or Dennis Clifford are the reason for BC's terrible record. With the loss, BC finished 4-14 in the ACC. That's good for a 14 seed in this week's ACC Tournament. There's no spinning that. If the team's spirit was crushed by the early losses, than their inability to regroup is also Donahue's fault. We knew what the ACC schedule entailed and we finished 14 out of 15 teams. That's inexcusable. Hanlon and Anderson remained the most consistent bright spots. I still believe that they are enough to build a winning season around next year. I hope the new coach agrees. Despite our defensive ineptitude and lack of size, I don't want to diminish T.J. Warren's day. 42 points is impressive regardless of the opponent. Basketball wasn't the only team with a forgettable Sunday. The Women's Hockey team lost the Hockey East Final to BU. Fortunately they are still heading for the NCAA postseason. Assuming a change is made, Bates will have plenty of choices for replacements. Our new AD keeps things pretty close to the vest, so we don't know which way he will go. I've featured some of the top candidates. Here are some other names that will get floated by agents, media, BC fans and BC admins. -- Mike Lonergan. George Washington Head Coach. -- Chris Mack. Xavier Head Coach. -- Ed Cooley. Providence Head Coach. -- Tommy Amaker. Harvard Head Coach. -- Chris Mooney. Richmond Head Coach. -- Steve Wojciechowski. Duke Assistant. -- Tim Cluess. Iona Head Coach. -- Pat Skerry. Townson Head Coach. -- Randy Bennett. Saint Mary's Head Coach. -- Tim O'Shea. Bryant Head Coach. BC Grad. -- Mark Schmidt. St. Bonaventure Head Coach. BC Grad. Of these guys, I would say Amaker, Lonergan and Cooley are the most likely real candidates. By "real" I mean they will get interviews and would have real interest in the job. 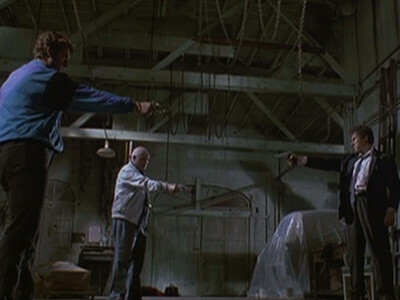 I like Joe Jones, but think his ties to Donahue kill his chances. 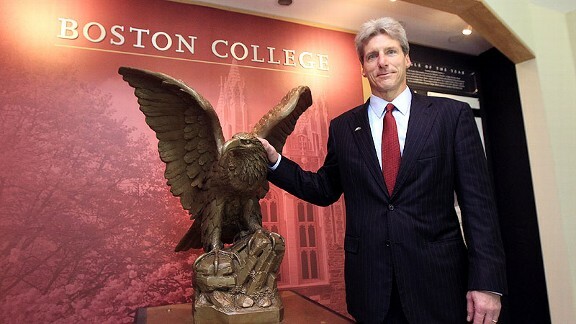 I like O'Shea and Schmidt but don't think either would even get a sniff of the job if they had not graduated from BC. Look for them to get courtesy interviews. All of these guys have a gap or two on their resumes. I still think Bates needs to make a real effort with Pearl and Howland. After that, the field is wide open. NJ.com is rolling out a series on the best prospects in the state. It might as well serve as a guide for how Addazio plans to build the 2015 recruiting class. Of the eight players featured so far, seven have BC offers. While we certainly won't sign every elite player in New Jersey, Addazio's aggressiveness is encouraging. Get to know the guys in the profiles below. HD wrote about the turnover at QB within the ACC. Tyler Murphy isn't the only former Florida QB looking for a second chance. Former Eagle Dan Koppen joined a Rhode Island powerhouse as a volunteer assistant coach. Best of luck to him. Men's Soccer added depth to their coaching staff. Noble and Greenough star Miles Wood committed to BC Wednesday. One of the top uncommitted players available, Wood selected BC over BU and Brown. The Women's Basketball team didn't last long in the ACC Tournament. Virginia won the opener 74-59. The team finished 12-19 on the season. Softball split a doubleheader with UCF Wednesday. BC is battling a bunch of Big Ten schools for WR Juwan Johnson. BC is one of many schools offering 2016 recruit Brandon McIlwain a shot at QB. I already wrote about how the close losses narrative bothers me. Bad luck comes into play in all sports, but in general, your close games will even out over time. If you look at the whole season, BC did lose eight games by four points or less. However, they won three games by four or less. That is a little unlucky, but not as dramatic as the announcers made it. Even if you completely flipped the luck and won eight of the 11 close games, BC would still stand at 13-17 with one game left. Would that change the decision on Donahue? Not in my opinion. As BC fouled late in Tuesday's loss to Florida State, ESPN U ran a graphic showing all of BC's close losses this year. I guess it is the newest attempt to explain away BC's hard luck. However, it is also really dishonest as to why we lose and why we lost to Florida State. BC had plenty of possessions to tie the game or even take the lead. But over and over, BC was beaten on the boards. And while we made plenty of 3s, we couldn't buy one late. Hanlan played well and Heckmann continued his good play. Unfortunately it was Ryan Anderson's turn to go cold. Anderson just wasn't a factor in the offense for the first half. How does that happen? It is once again another example of being too complex for your own good. We were hitting 3s in the first half, so we didn't necessarily need points from Anderson, but there are benefits to getting him the ball. He draws fouls. He converts at a high percentage. Like so much else, it doesn't really matter. We lost any way. Continued losing doesn't doesn't change much. I'm sorry Senior Night didn't have a better ending. Let's hope the final game does. While maximizing wins next season shouldn't be the main priority when looking for a new BC coach, it will be a consideration. If there is one guy who could smoothly transition to Donahue's roster it would be Greg McDermott. If anything McDermott would probably have our team shooting even more 3s and pushing tempo that much more. McDermott's success appeals on many levels. But there are also a few questions that would keep him from being a sure thing. Although Doug McDermott is carrying this current Creighton team, Greg was winning well before his son reached college. Creighton is his fifth college head coaching job. All stops showed the typical progression until he reached Iowa State. In four years in the Big XII, he never finished the season above .500 and was near the bottom of the conference. When he got a lifeline from Creighton he bailed and jump started his career. The Blue Jays have been very good since he took over with a mix of highly efficient offense and solid defense. In fact, McDermott is proof that you can have a Top 10 offense and still have a Top 100 defense without great athleticism. Even without his son as part of a package deal, I am willing to roll the dice with McDermott. He has many of Donahue's positive aspects yet wins at a higher rate and coaches better defense. He's got a longterm deal and now that Creighton is in the Big East, it is a better job than it once was. I have no idea if he would want the BC job. But it wouldn't hurt Bates to reach out. When Jags fired Jim Turner shortly into his tenure as Head Coach, BC kept it in the family by replacing Turner with Jack Bicknell Jr. Bick was the opposite of Turner in many ways and quickly won over the OLine. Bicknell will have to use some of those same people and coaching skills again as he is replacing Turner as an Offensive Line Coach with the Miami Dolphins. Bick won't be doing it alone. He's technically the assistant OLine coach, but I assume he will do his part of changing the culture. I don't know why Bicknell has bounced around the NFL since leaving BC, but based on the success he had replacing (and repairing a unit) after Turner once, I assume he can do it again. Because it can never be easy as a BC fan, just when Basketball puts together a decent road win, Hockey sees Notre Dame snap their unbeaten streak in OT. The win was nice but the basketball game still generated a lot of frustration. BC didn't shoot well. The pace was all over the place due to Wake fouling. Hanlan started hot but then couldn't buy a basket for long stretches. But the game was actually won with rebounding and defense. BC took advantage of plenty of Wake turnovers and didn't let the Deacons dominate the boards. The fact that BC can win that way makes so many of our previous losses that much more head scratching. We also used a lot of 2-3. Who knows why we haven't stuck with it more this season? But the zone, and using actual bigs at the 5 spot allowed Anderson to put together one of his most efficient games of the year. It is all too little, too late but I still want to see the team end the season on a high note. Let's hope the improved D continues against Florida State Tuesday. Why does it always have to be Notre Dame? Remember when BC started off the 04-05 basketball season 20-0 only to have the Irish end the streak. Well Saturday afternoon the Irish handed BC their first loss in 92 days. Fortunately the Irish weren't able to end Johnny Gaudreau's scoring streak. While disappointing, the loss doesn't impact Hockey East seedings. BC will still be the No. 1 team and looking to take home another title. The Hockey team is now off until the start of The Hockey East Tournament March 14.